A series of new street and newspaper advertisements, with the tagline ‘We are defined by the choices we make’, are confusing and beguiling Dublin pedestrians and readers of the Irish Independent. 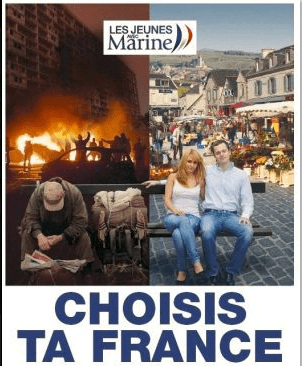 The ads are reminiscent of the Front National campaign that caused outrage across France when voters were urged to choose between one image of France and another. The image of Seine -Saint Denis, in the northeast of Paris, burning during the riots in the poor and migrant areas was contrasted with an image of a white family relaxing in sunlight. The fascist Front National are well known for their anti-gay and pro-life beliefs and it has prompted suggestion that Ireland’s own Youth Defence or one of the variety of post-box-names that is used for various American-backed campaigns is behind this particular venture. I’m going to sound stupid here, but who’s the guy on the left? Yeah, you sound thick and ignorant. Apart from the combo of ‘truism’ and ‘striking contrasting images’ do these have anything to actually do with pro-life or right wing agenda?. I generally like Rabble’s left leaning libertarian view but please don’t use the pro-life lobby and other organisations as some sort of bogeymen that we can pin everything, including what appears to be non-partisan billboards. Real journalism would of researched who is behind them, try to understand their goals and give readers a better understanding to the world. Surely Rabble is better than Broadsheet. Broadsheet is great. My take is that these are nothing more than a particularly effective viral marketing campaign. I really doubt they were inspired by the French National Front posters although some similarities have been noted. Definitely well funded and quite likely an advertising campaign for something or other. I’ve heard that there is a connection to the tv series Love/Hate but can’t confirm that yet. I wouldn’t jump the gun on the pro-life thing either and really hope that this has nothing to do with them. It would be really bizarre for them to use the word ‘choice’ so often in an anti-choice campaign for a start . . .
Are they some comment on militarism? Dev the politician/Collins the General, Unarmed cop/armed cop, violent street protest/peaceful civic building….could be a comment on violence towards others and the repercussions of such?? Very loaded imagery which makes it difficult to understand the message behind it. Whatever they’re about, it seems to be working brilliantly. 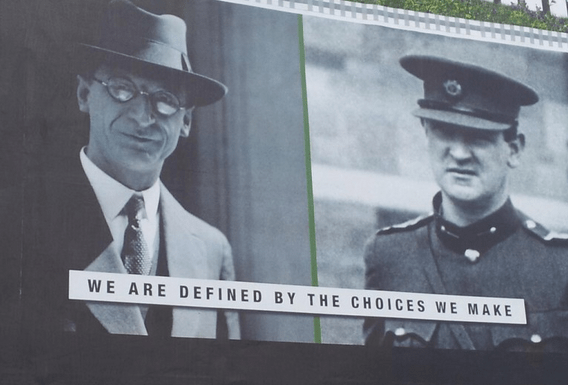 @ Conor – the stupid question is the question not asked – think it’s De Valera and Collins. International worldwide Zionist conspiracy designed to lead to years of autocratic American hegemony. It’s obviously Pepsi. ‘The choice of a new de-generation’. Could it be Independent News and Media? This fascist ad campaign is annoying me http://t.co/CFqpvspTs8 #media #news #dublin #marketing #pr Whose behind it?